What Foods Are High in Refined Sugars? Craving ice cream or cake? Do you find yourself daydreaming about cookies? These treats do taste amazing, but they're loaded with sugar and empty calories. Refined sugar has been linked to heart disease, diabetes, chronic inflammation and obesity, among other health problems. Do you really want to take this risk? Cake, cookies, candy, juice and soda are just a few types of foods that are high in refined sugars. Most foods contain carbohydrates, including sugars. The only exceptions are unprocessed meat, eggs, fish and some dairy products. A medium banana, for example, contains 14.4 grams of sugars. These natural compounds are often referred to as simple carbs. Refined sugar, on the other hand, is extracted from sugar beets or sugar cane and then added to a variety of products, from candy and chocolate to soft drinks. This nutrient is quickly absorbed into the bloodstream, causing insulin and blood glucose spikes. It's estimated that about 74 percent of packaged foods contain refined sugar. Breakfast cereals, bread, potato chips, energy bars and commercial fruit juices are just a few examples. The processed sugar in these foods contributes to weight gain, hyperglycemia and metabolic disorders. According to a 2017 study published in Scientific Reports, high-sugar diets may increase the risk of developing depression and mental disorders. Another study, which appeared in the American Journal of Public Health in 2014, has linked sugar-sweetened beverages to accelerated cell aging. Refined sugars, also referred to as refined carbohydrates, are found in processed foods and beverages. Breakfast cereals, for example, can have as much as 26 grams of sugar per cup. The American Heart Association recommends that women limit their sugar intake to 25 grams per day, which is equal to 6 teaspoons. If you're a man, try not to exceed 38 grams of added sugar daily, which is equal to 9 teaspoons. Beware that many seemingly healthy foods are nothing but candy in disguise. Fruit yogurt, for instance, has around 32 grams of sugars per serving. This sneaky ingredient is often listed under different names on food labels, creating confusion among consumers. Golden syrup, corn syrup, coconut sugar, fruit juice concentrate and caramel are all examples of refined sugar. In fact, many processed foods don't even have the word "sugar" listed on the label. Even your favorite protein bar or sports drink may contain this ingredient in some form or another. The next time you go shopping, keep a list on hand of the most sugary products on grocery store shelves. Chocolate cookies, shortbread cookies, macaroons and other sweets are packed with sugar. Except for organic brands, they may also contain preservatives, flavor enhancers and other chemicals. Another drawback is their high content of trans fat, which contributes to heart disease, stroke and diabetes. Shortbread cookies, for example, contain 146 calories and 6.1 grams of sugars per ounce, or about two cookies. The same amount of oatmeal raisin cookies, which is equal to about one cookie, has 125 calories and 9.4 grams of sugars. Although they contain whole grains, you'll get less than 1 gram of fiber per ounce. A medium chocolate chip cookie provides 148 calories and 9.9 grams of sugars. However, this doesn't mean you should give up cookies forever. Feel free to enjoy them every now and then — just don't make a habit out of it. Another option is to re-create classic recipes using healthier ingredients. Swap butter and margarine for coconut oil; replace sugar with stevia; substitute milk chocolate with extra dark chocolate or raw cocoa; almond flour, coconut flour, konjac flour and whole grain flour are all excellent alternatives to white flour. Granola and breakfast cereals are among the most popular processed sugar foods for children and teens. Despite being marketed as healthy, they're loaded with refined carbs. In 2014, the American Journal of Clinical Nutrition published a clinical trial comparing the effects of whole and refined grains on blood sugar levels, waist circumference and other markers of metabolic syndrome. The prevalence of prediabetes was reduced in subjects who consumed whole grains. Their blood glucose levels were lower too. Scientists point out that whole grains are higher in fiber, vitamins, minerals and phytochemicals compared to refined cereals. A more recent study published by the American Journal of Clinical Nutrition in 2017 found that eating refined grains during pregnancy may increase children's risk of weight gain and obesity later in life. Replacing breakfast cereals with whole grains may lower this risk by as much as 10 percent. Wheat bran, oats, barley, rye and other whole grains are healthier compared to their processed counterparts, and they contain no added sugar. Soft drinks, bottled smoothies and store-bought fruit juices taste so great for a reason. These products are chock-full of sugar, artificial sweeteners and synthetic flavors. In fact, the fruit juices available in stores actually contain little or no fruit. According to Susan Jebb, professor of diet and population health at the University of Oxford, these beverages have just as much sugar as traditional soft drinks. Sugar-sweetened beverages not only contribute to obesity but also affect liver health and may lead to nonalcoholic fatty liver disease and diabetes. Diet soda, which contains artificial sweeteners, may pose health risks too. If you're craving fruit juice, eat the whole fruit instead. It will quench your thirst, keep you full longer and increase your nutrient intake. An occasional glass of fruit juice isn't harmful as long as you don't go overboard. Herbal tea, fruit-infused water, lemon water and vegetable juices are all healthier alternatives to soda. Sweets, pastries and soft drinks are not the only sources of refined sugar. This ingredient is also added to deli meats, BBQ sauce, ketchup, mustard and even diet foods. One tablespoon of barbecue sauce, for example, has 5.6 grams of sugars. The same amount of ketchup contains 3.4 grams of sugars. Beware of flavored yogurt, ready-made meals, canned soup, jam, fruit spreads, coffee drinks and iced tea. These products are high in refined carbohydrates and have little nutritional value. If you don't add sugar to your coffee at home, why would you buy a frappe or a latte macchiato? The latter contains nothing but empty calories. Choose foods and beverages labeled sugar-free, no added sugars or reduced sugar. Make your own sauces, salad dressings and granola bars at home. If you have a sweet tooth, add sliced fruit and raw nuts to a cup of plain yogurt. You'll get a delicious, filling treat that offers both flavor and nutrition. Cancer Center: Natural vs. Refined Sugars: What's the Difference? 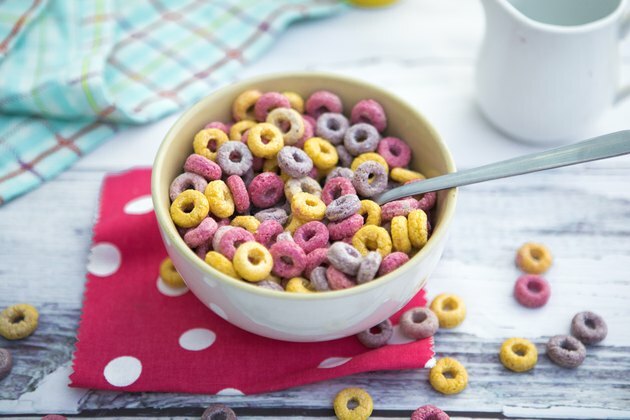 Eat This: The 28 Worst Breakfast Cereals—Ranked! Is the Sugar in Fruit Bad for You? How Much Sugar Should a Teen Have a Day? How Many Calories Are in One Tablespoon of Sugar?